I received a message from a reader recently who was frustrated and simply needed to vent. I maintain this invitation to any of my readers, especially those who work in the nonprofit sector: if you ever need to get something off of your chest and can’t do so publicly for fear of offending donors, volunteers, or board members, you can vent to me. I’m a good listener/reader. If you lived in the Jacmel area I’d invite you to come sit on my porch, have a beer, and complain about whatever it is that’s got you stressed. Because I understand. But for those without access to my porch, my inbox is open to you. And even if you say something that inspires a blog post on my part, I promise to keep your rants anonymous. I think that it is one of the greatest problems facing the nonprofit sector that the majority of people think that it is uncriticizable because they’re all “helping” people. The individuals who carry out the work who have the closest perspective to the situations at hand and the most real relationships to the beneficiaries and the greatest sense of understanding are silenced in an attempt to allow the people who are giving the money and making the decisions to live blindly disillusioned about whether they really truly are helping or not or helping in the most effective way. It’s a crime, really. But I digress. Back to my reader who wrote me. She works with children’s programs in Haiti and in her rant she said, “If have one more person come down to take selfies with [the kids in our programs], I’m going to scream!” Later in the message she referred to these people as “selfieblan”, which honestly cracked me up and I call upon all of my readers to make that hashtag go viral immediately. This subject has gotten a lot of mileage lately with articles like The Onion’s, 6-Day Visit To Rural African Village Completely Changes Woman’s Facebook Profile Picture, and the Tumblr account, Humanitarians of Tinder. Some of my fellow Haiti expat bloggers have also shared personal experiences such as Jillian’s Missionary Confessions, When in Haiti Bring Your Camera, but Also Bring Your Respect. (<– Seriously, click on those if you haven’t seen them yet.) So I don’t need to repeat anything that’s already been said, but I do want to add my voice to the common cry that implores volunteers and donors who visit programs in cultures not of their own, “Quit offending local people with your photos!” It’s not that difficult. It is understood that you need to take photos to tell the story of your trip and hopefully to promote growth of the projects you’re visiting, but there’s a better way to do it with dignity for everyone involved. Especially now with the pervasiveness of social media in our lives now we need to be extra sensitive to the images that we’re sharing of others that will be out there for the world to see. So here are a few of my simple Green Mango suggestions of things to remember when you’re on a volunteer trip with your camera or smartphone in your hand. Although modern voluntourism has become much more about the experience of the person on the trip than the benefits for the local people they are tripping to, the truth is that all of your Facebook friends already know what you look like. By simple virtue of having taken the photo, you’ve proven that you were there. You do not need to be the center of attention. Use your photos to show off the beauty of the place and the people that you are visiting. Use them to share things about this world that your Facebook friends might not already realize. Do not use local people in your photos just to make yourself look like a better White Savior. 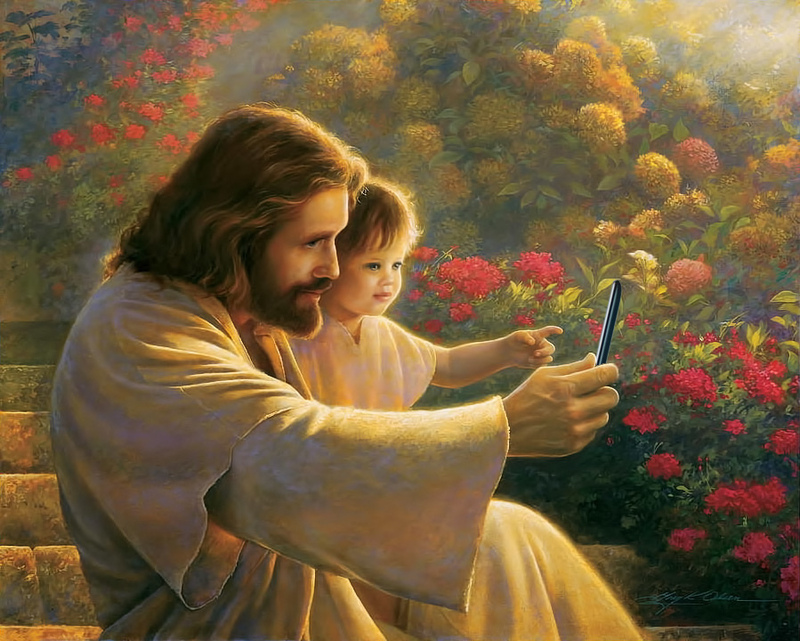 Jesus told all of the little children to come to him so that he could show them how God loves them, not so he could take a selfie with them. Use photos to represent relationships. If you won’t be able to tell anyone the names of the people in the photos with you later, then you probably don’t need to be taking their photo. If you’ve made good friends on your trips and want to remember the times you’ve enjoyed with them, then take pictures with those people. The little boy that you gave a sucker to in the street, probably not. The old woman that asked for some money to feed her kids, probably not. The cooks that made your meal every day and laughed with you when their piklies was so spicy that it made your eyes water, sure. The fact that I even have to say this makes me ashamed of humanity. Don’t ever take someone’s picture if they don’t want you to. If you want to take pictures of vendors in the market, buy something from them first for crying out loud, then ASK if you can take their picture. If someone just walked into your place of work and started taking photos of you without any explanation, I doubt you’d be too happy either. Just ask. And if they say no, move on with your life. 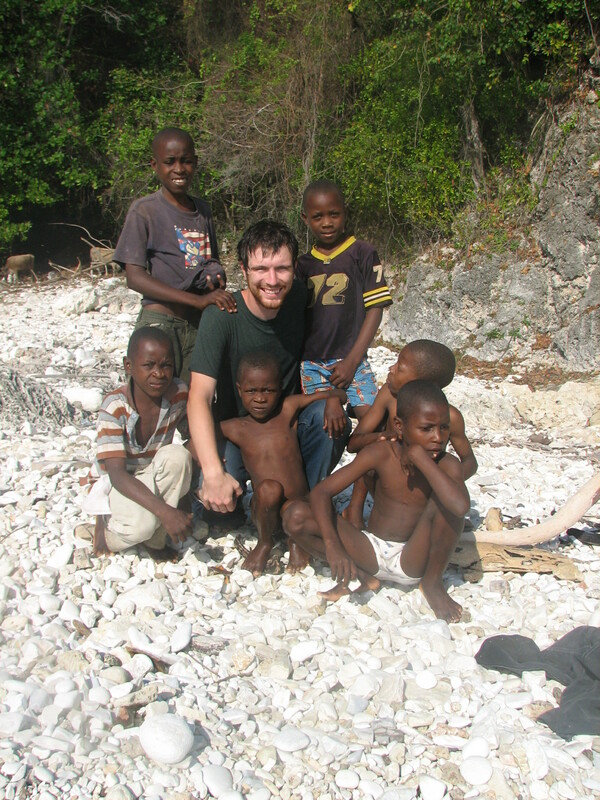 A photo from my early days in Haiti. I have no idea who these half naked boys are and never saw them again. Or in their parent’s shoes. How would you feel if a stranger came up and stuck a camera in your face? How would you feel if you knew that strangers were taking photos of your children and would be posting those photos to the internet as if they were best friends with your kids? Do you want your photo taken when you’re not feeling your best, are sad, or sick? Or just when you haven’t bathed for the day, had your coffee, are still in your pajamas? What if you had a flat tire and someone stopped to help you but before they leave they ask to take a picture to share with all of their friends? You’d know that person was just looking for a pat on the back and wasn’t really interested in helping another human who just needed help. Make it come back to the subject. If you’ve asked permission and they’ve agreed to let you take their picture, they’re probably doing so with the expectation that you’re going to take that photo and use it to promote programs and raise funds that will benefit them in some way. I learned to be even more specific with individual’s who ask to take photos at our organization, like at our school. If you want to take photos of our school and the kids there, then you’d sure better be sending some money back to us sometime in the future. You had better take those photos and tell everyone who sees them exactly how they can donate to us. Don’t use our programs and our participants to simply share with people about all of the need that you’ve seen. Be actively searching for ways to help satisfy those needs that you’ve seen through those photos. Otherwise the subjects just end up feeling used and exploited. The first time I see a volontourist or mission team do this, I will give them the Do Gooder of the Year Award. There are people here who make a living as photographers and are able to get a lot more interesting photos than you because of their existing place within the culture. Hire one of them to join you for the week and take photos of all of your activities. You’ll be providing another local person with a job, you’ll be getting better photographs, you’ll be free to focus on the work that you’re doing and the people that you’re getting to know, and you’ll end up in more photos yourself without looking like a vapid narcissist. It’s a win-win for everybody! There you have it. Happy picture taking! If you have any funny examples or stories of you breaking these rules, post them in the comments below. She doesn’t mean for it to be racist, she just really doesn’t understand why I don’t paint flowers or a nice lake or something once in a while. She doesn’t understand why, I, a very white man from a very white family in a very white small town in Iowa, would choose to make artwork with subjects whose skin color is so different from mine and my family’s and the majority of the people’s who view my work in shows in the Midwest. She knows that I live in a place where everybody except me is black, so the images that I paint reflect the world that I see every day. But the reality of where I create most of my art and where I display and sell most of my art is very different. And to grandma that doesn’t make sense. But to me, it wouldn’t make sense to paint anything else. Beyond the color of their skin and the texture of their hair, the people that I paint most effectively represent who I am as a human and as an artist. I would hope that other viewers of the work, no matter what their skin color is, would also be able to find something about the subjects of my paintings that reflects who they are. But the truth is that a lot of people will still see black men painted by a white man and not much more. So, this week when I heard the news of Rachel Dolezal, a leader in the NAACP who had been living as a black woman for years despite having been born to white parents with curly blonde hair and blue eyes, I started to listen closely. It’s a strange story that has people of all races confused, some angered, others amused. And as I read through the news stories of her life, and all that she went through to convince people that she was black, I was a bit confused myself. But then I read a story that pointed out that in college as an art student she once submitted a portfolio of work that was all portraits of black people. This little bit of information, which might get lost on most readers, was used as proof of her delusion even back then. That’s when I started to see her side of the story a bit clearer. When someone makes the claim that “because she was a white person painting black people” clearly she’s not right in the head, then I start to get a little defensive. Clearly the debate is not actually about her artwork but about how she used her ability to pass as a black woman as a way to become a leader in an organization that represents the interests of African Americans. But all of these pieces of her past are used to suggest that she has been “appropriating,” “fetishizing,” and “exploiting” a culture that does not belong to her for years. Now this is where I think we have to be very careful of labeling any white person who feels more naturally a part of black culture with these labels. In the dialog surrounding Dolezal, the word “transracial” has come up, mostly to be discredited completely by the media as absolute bullhunky. And this is where I start to feel myself more personally pulled into Dolezal’s story. Because although I would never try to alter my appearance or claim that I was actually black, in almost every aspect of my life, I identify much more strongly with black culture than the culture that I was born into as a white man. My favorite visual artists, writers, and musicians are all black. I listen to hip hop music and watch films by black people, filled with black people. I feel most fully myself when I am surrounded by black people. All of my closest friends are black. Most of the people I’ve ever dated are black. I now live in the world’s first black republic. I speak a very black language. My white friends back home frequently comment on how much happier and more alive I seem when I am here living the life of a black Haitian. And yet my skin is very white. You can ask the sunburn that is currently making my forehead peel. White. Still, to my grandma’s chagrin, I continue to make paintings filled with black men. And the only thing keeping my artwork from being labeled appropriative, fetishizing, and exploiting, is the fact that the subjects are Haitian and not African American. So instead of being considered cultural appropriation, they can be called humanitarian activism or cross cultural awareness. Because even when compared to black Americans, black Haitians are still considered less than, in need of help, deserving of pity. 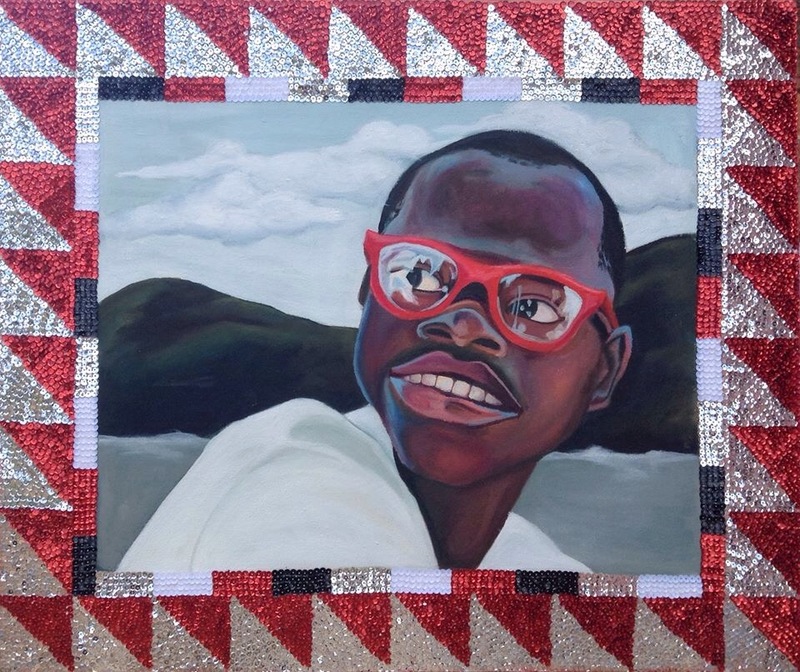 So when I live a life entirely defined by black Haitian culture and become a leader in an organization working on behalf of black Haitians and make art of black Haitians, I am considered to be helping and advocating and doing good work. But when Rachel Dolezal lives a life entirely defined by African American culture and becomes a leader in an African American culture, and makes art of African Americans, she is considered to be harming and offending and reversing progress. To me it’s a very strange sort of evidence of modern day imperialism and the White/Western Savior Complex still rearing its ugly head. Because black Haitian culture is still considered by so many as something needing help, I am encouraged as a white guy to paint black people and record hip hop music and study voodoo culture and still be seen to be helping the poor black Haitians through it all. I cannot be seen as simply appreciating the beauty and the power and the message within those cultural mediums, I have to be seen as helping in order to make it legitimate. I am not allowed to really feel a part of them but have to be seen as lifting them up from the outside because that is what the “white man’s burden” is. But African Americans still maintain their dignity enough to a point where a white person appreciating their culture is seen as the opposite of helping. A white person immersing themselves in African American culture is an unwelcome slap in the face. All of the good work that Dolezal has done, which the NAACP continues to stand by, gets criticized because of an underlying understanding that African Americans are still Americans and we don’t share our identities with anyone unless we can impose them upon them. So the real difference and the real offense in Dolezal’s story comes down to the fact that she lied about it. And this brings me back to the term transracial. It makes me wonder if much like in gender identities and sexual orientation identities and religious identities, maybe we need to start allowing some space for a grey area when it comes to racial identity. 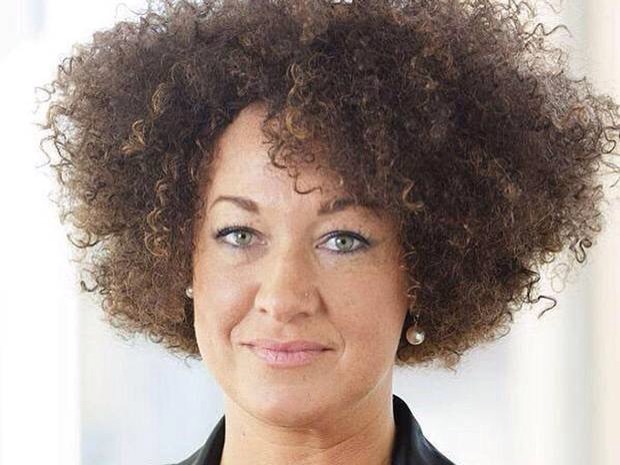 Because I have a feeling that if Rachel Dolezal was ever given the freedom to consider herself transracial from the start, she wouldn’t have ever had to lie about being black. She could have openly identified as a women born with Caucasian skin, but identifying within her spirit much more strongly with black culture. She would not have had to reject her family or build such an elaborate fairy tale. But because that option was never given to her and because even now that option is being discredited as nonsense, she felt like she had to go to the extreme lengths that she did in order to live the life that felt most natural to her. And in that sense, I have to defend her right to live that life. I have a feeling that given the option, there are more people than we realize who might truly identify as transracial throughout history. There are certainly examples of others changing their race not for survival but simply because they want to feel more themselves. This certainly is not said to discount the histories of the many people who have had to pose as different races for their safety and freedom, their trials should be remembered and celebrated as truly contributing to the progress of civil rights. But to me, Dolezal’s story is much more one of individual rights, one that I, and I think many others, can sympathize with on some level. It’s true that she can never know what it’s like to have grown up black and endured the discrimination and overcome the obstacles that come with that. But it’s also true that her wanting to be part of the present and future struggles of that group by making herself culturally, spiritually, and even physically a part of that group didn’t hurt anyone. So why can’t there be a space allowed for her and others like her to feel welcome to express their identity how they want? So I’m not going to say that this is or isn’t racism or that transracial is or isn’t a thing because I believe that those who’ve experienced racism are the ones who get to define what it is. However, if I was ever offered the option to identify as transracial, would I? I can’t say for sure. I typically don’t like labels of any kind for any reason and I prefer to perceive people according to their deepest parts rather than their outside parts. But in this case, I can guarantee you that I’d be tempted. I would be tempted to get comfortable in that identifiable grey area. So tell me what you think. I know I’ve got readers of all races on this blog. Is Rachel Dolezal delusional or brave? An insult or encouragement? Offensive or misunderstood? Or something in between that we as a society aren’t quite ready to recognize yet? Are there any parts of her story that you can relate to?